Objectives To compare the efficacy of standard treatment, standard treatment plus acupuncture, and standard treatment plus stabilising exercises for pelvic girdle pain during pregnancy. Design Randomised single blind controlled trial. Settings East Hospital, Gothenburg, and 27 maternity care centres in Sweden. Participants 386 pregnant women with pelvic girdle pain. Interventions Treatment for six weeks with standard treatment (n = 130), standard treatment plus acupuncture (n = 125), or standard treatment plus stabilising exercises (n = 131). Main outcome measures Primary outcome measure was pain (visual analogue scale); secondary outcome measure was assessment of severity of pelvic girdle pain by an independent examiner before and after treatment. Results After treatment the stabilising exercise group had less pain than the standard group in the morning (median difference = 9, 95% confidence interval 1.7 to 12.8; P = 0.0312) and in the evening (13, 2.7 to 17.5; P = 0.0245). The acupuncture group, in turn, had less pain in the evening than the stabilising exercise group (−14, −18.1 to −3.3; P = 0.0130). Furthermore, the acupuncture group had less pain than the standard treatment group in the morning (12, 5.9 to 17.3; P < 0.001) and in the evening (27, 13.3 to 29.5; P < 0.001). Attenuation of pelvic girdle pain as assessed by the independent examiner was greatest in the acupuncture group. Conclusion Acupuncture and stabilising exercises constitute efficient complements to standard treatment for the management of pelvic girdle pain during pregnancy. Acupuncture was superior to stabilising exercises in this study. Standard treatment may consist of a pelvic belt, a home exercise programme, and patient education. A systematic review has shown that the efficacy of these interventions remains questionable.9 Current treatment increasingly includes stabilising exercises and acupuncture.10–12 However, insufficient evidence is available to give strong recommendations for or against any particular treatment modality for pelvic girdle pain.13 We compared the efficacy of acupuncture or stabilising exercises as an adjunct to standard treatment with standard treatment alone for the treatment of pelvic girdle pain in pregnant women. The study was a randomised single blind trial done at East Hospital, Sahlgrenska Academy, and at 27 maternity care centres in the hospital's reference area in Gothenburg, Sweden, from 2000 to 2002. Doctors and midwifes at the 27 maternity care centres preselected consecutive patients. Participants filled in a previously validated questionnaire2 and a diary for baseline information for one week before the inclusion visit. An independent specially trained physiotherapist then assessed patients who were eligible and willing to participate in the study. This assessment included a detailed standardised physical examination and collection of baseline data. The tests used were the posterior pelvic pain provocation test, Patrick's fabere test, a modified Trendelenburg's test, Lasegue test, and palpation of the symphysis pubis.5 8 The main inclusion criteria were healthy women at 12-31 completed gestational weeks, well integrated in the Swedish language, with singleton fetuses and defined pregnancy related pelvic girdle pain. We excluded patients with other pain conditions, systemic disorders, or contraindications to treatment. The participants gave informed consent. A research assistant used a computer generated random table to determine the allocation sequence before the study. Groups were coded, and the allocation was transferred to a series of presealed opaque envelopes. The independent examiner randomised the patients individually after doing the baseline assessment. The study comprised a one week baseline period, six weeks of treatment, and follow up one week after the last treatment. Patients were asked to avoid other treatments during the intervention period. Three experienced physiotherapists gave standard treatment, two experienced medical acupuncturists did acupuncture, and two experienced physiotherapists gave the stabilising exercises. All possible adverse events were recorded. Standard treatment group—Standard treatment consisted of general information about the condition and anatomy of the back and pelvis. Adequate advice was given about activities of daily living. The physiotherapist made sure that the patient understood and respected the relation between impairment, load demand, and actual loading capacity as well as the importance of necessary rest. The purpose of this information was to reduce fear and to enable patients to become active in their own treatment. The patients were given a pelvic belt (Puff Igång AB, Sweden) and a home exercise programme designed to increase strength in the abdominal and gluteal muscles. Acupuncture—Patients received the same treatment as in the standard group but in addition had acupuncture. Local acupuncture points were selected individually after diagnostic palpation to identify sensitive spots.14 A total of 10 segmental points and seven extrasegmental points were used (table 1). The needles (Hegu AB, Landsbro, Sweden) were made of stainless steel (⊘ 0.30) and inserted intramuscularly to a depth of 15-70 mm to evoke needle sensation (De Qi), described as tension, numbness, and often a radiating sensation from the point of insertion, reflecting activation of muscle-nerve afferents. The needles were left in situ for 30 minutes and manually stimulated every 10 minutes. Treatment was given twice a week over six weeks. Fetal heart rate and maternal heart rate and blood pressure were monitored before and after all treatments. Stabilising exercises—Patients received the same treatment as in the standard group but in addition did stabilising exercises modified because of the pregnancy (box).15 16 The training programme started by emphasising activation and control of local deep lumbopelvic muscles. Training of more superficial muscles in dynamic exercises to improve mobility, strength, and endurance capacity was gradually included. Patients received treatments individually for a total of six hours during six weeks. They were told to integrate the exercises in daily activities and to exercise in short sessions on several occasions during the day. Primary outcome measure—Patients scored their current intensity of pelvic pain related to motion on a 100 point visual analogue scale every morning and every evening in the diaries. Secondary outcome measures—The independent examiner assessed recovery from symptoms. Patients were asked not to reveal any information about their treatment during assessment. When planning the study we assumed that the mean pain score related to motion at baseline would be 60 mm (visual analogue scale) in all three groups. We did not expect any treatment effect in the standard group. We assumed that the mean pain score after treatment would be 60 mm in the standard group, 50 mm in one treatment group, and 40 mm in the other. To achieve a 90% power of detecting a significance (at the two sided 5% level), with an assumed standard deviation of 40, we needed 103 patients for each study group. To compensate for an anticipated loss to follow up of 20%, we needed 386 patients. When analysing the study we decided to apply the Mann-Whitney U test for comparing changes in pain scores, with Bonferroni's correction (P values multiplied by three). The power achieved with that method was 86% for comparison of the two most extreme groups, provided that δμ/σ = 0.5. Personnel from an independent institution coded all results from the study and entered them into a database. Analyses were done by intention to treat. The statistician who did the analysis was blinded to group and treatment. In the analysis of the pain diaries we defined the median visual analogue scale baseline levels in the mornings and in the evenings for each patient by calculating the median for the days before treatment (five to seven days). The same calculations of median pain were done for the first week after the end of treatment. We calculated the medians, quartiles, means, and standard deviations when possible. We used the Mann-Whitney U test to compare differences between the groups for continuous variables and χ2 for categorical variables. Adjustments (multiplication by three) of the P values due to multiple comparisons were done by Bonferroni's method. We considered an adjusted P value < 0.05 to be statistically significant. We calculated median differences and confidence intervals for the differences between medians on the basis of the Mann-Whitney U test. We also did an analysis of treatment effects in patients divided into four subgroups17: one sided sacroiliac pain, double sided sacroiliac pain, one sided sacroiliac pain plus symphysis pubis pain, and pelvic girdle syndrome (double sided sacroiliac pain plus symphysis pubis pain). The results were analysed with the SAS software package, version V8. Of 558 women referred for the first assessment, 172 did not meet the inclusion criteria; 386 women were included in the trial. Baseline characteristics were similar in the three treatment groups (table 2). 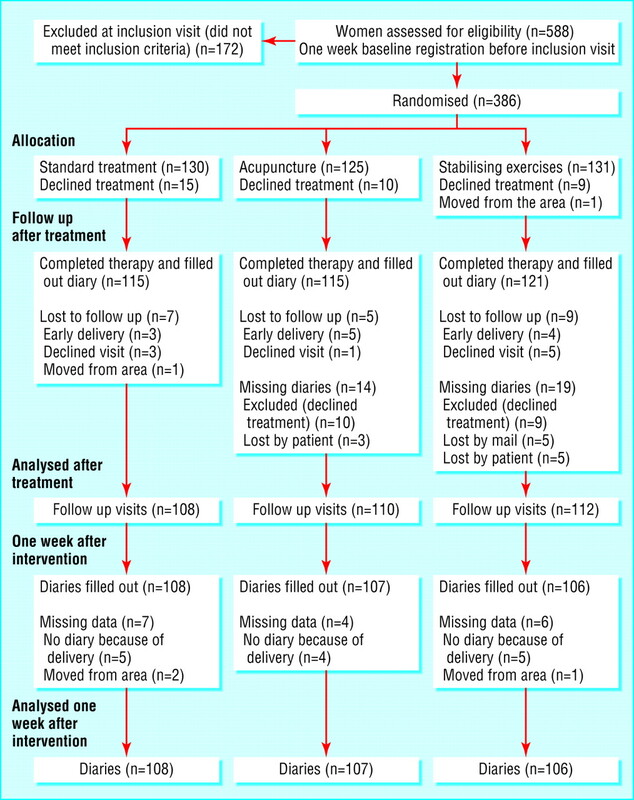 The figure show the progress of patients through the trial and withdrawals from the study. Table 3 shows improvements in pain scores. The reduction in pain was most pronounced in the evening in the acupuncture group one week after the end of treatment, compared with the other treatment groups. Table 4 shows that attenuation of pelvic girdle pain assessed by the independent examiner was greatest in the acupuncture group. Three of four subgroups of pelvic girdle pain improved after acupuncture compared with standard treatment and one of four subgroups improved compared with the stabilising exercise group. The stabilisation group also got additional treatment of stretching exercises of specific muscles plus massage. All treatment was more or less multifactorial, and massage as well as stretching may have had some contributory effect. The main training, however, was the stabilisation exercises that were done on several occasions during the day, in contrast to the stretching or massage that was done only at the visits. Pain may be inhibited at the segmental level, and for this reason the acupuncture points were selected in muscle segments according to the patient's pain drawing, including diagnostic palpation to identify sensitive spots. The aim was to establish control of pelvic pain to prevent dysfunction of muscles of the spine and pelvis. Speculatively, this was achieved through activation of both the segmental pain inhibitory system, involving the so called gate control mechanism, and the central pain inhibitory system, involving secretion of endogenous opioids.14 Extrasegmental points to the lumbosacral area were used to strengthen and lengthen the effect of the central control systems. In addition, well known general pain relieving points were selected. Whether the choice of acupuncture points and the method of stimulation in this study are optimal remains to be elucidated. This study shows that methods other than structured physiotherapy may be effective in treating pelvic girdle pain in pregnancy and that acupuncture represents an effective alternative. A combination of several methods is probably even better. Each method needs to be evaluated individually, however, before combinations can be recommended for future research, and only after that should recommendations for treatment be made. We conclude that acupuncture as well as stabilising exercises constitute effective complements to standard treatment for pregnant women with pelvic girdle pain. Acupuncture was superior to stabilising exercises in this study. The findings are of particular importance because no previous study has shown such marked treatment effects among pregnant women with well defined pelvic girdle pain. We thank physiotherapists E Roos-Hansson and G Zetherstrom for invaluable help with assessment of the patients. We thank physiotherapists T Larsson and K Wettergren and midwife K Frygner for treating the patients. We also express our appreciation to all the women for their contributions to this study. Contributors HE initiated and coordinated the study, did most of the data collection, and contributed to study design and interpretation of results. LL advised on data collection and assisted in study design. MFO assisted in study design and gathered data. H-CO guided the scientific process, assisted in study design, provided advice on the epidemiology of pelvic girdle pain, and obtained funding. HH guided the scientific process and assisted in study design. All investigators contributed to data interpretation and preparation of the manuscript. H-CO and HH are the guarantors. Funding The Vardal Foundation, the Dagmar Foundation, the Trygg-Hansa Insurance Company, and Sahlgrenska University Foundation provided funding. The study sponsors had no role in study design, data collection, data analysis, data interpretation, or writing of the report. Ethical approval The local ethics committee approved the study. .Is pelvic pain in pregnancy a welfare complaint?Acta Obstet Gynecol Scand2000; 79:24–30. .Regression of back and posterior pelvic pain after pregnancy.Spine1996; 21:2777–80. .Pregnancy-related pelvic girdle pain (PPP), I: terminology, presentation, and prevalence.Eur Spine J2004; 13:575–89. .Reduction of back and posterior pelvic pain in pregnancy.Spine1994; 19:894–900. .The posterior pelvic pain provocation test in pregnant women.Eur Spine J1994; 3:258–60. .Back pain in relation to pregnancy: a 6-year follow-up.Spine1997; 22:2945–50. .Discriminatory power of tests applied in back pain during pregnancy.Spine1996; 21:2337–43. .Evaluation of clinical tests used in classification procedures in pregnancy-related pelvic joint pain.Eur Spine J2000; 9:161–6. .Physical therapy for pregnancy-related low back and pelvic pain: a systematic review.Acta Obstet Gynecol Scand2003; 82:983–90. .The efficacy of a treatment program focusing on specific stabilizing exercises for pelvic girdle pain after pregnancy: a two-year follow-up of a randomized clinical trial.Spine2004; 29:E197–203. .A prospective randomized study comparing acupuncture with physiotherapy for low-back and pelvic pain in pregnancy.Acta Obstet Gynecol Scand2000; 79:331–5. .Acupuncture relieves pelvic and low-back pain in late pregnancy.Acta Obstet Gynecol Scand2004; 83:246–50. .Interventions for preventing and treating pelvic and back pain in pregnancy.Cochrane Database Syst Rev2002;(1): CD001139. .Pain mechanism: a new theory.Science1965; 150:971–9. .The relation between the transversus abdominis muscles, sacroiliac joint mechanics, and low back pain.Spine2002; 27:399–405. .Muscle control-pain control: what exercises would you prescribe?Man Ther2000; 1:2–10. .Incidence of four syndromes of pregnancy-related pelvic joint pain.Spine2002; 27:2831–4. .Insufficient lumbopelvic stability: a clinical, anatomical and biomechanical approach to ‘a-specific’ low back pain.Man Ther1998; 3:12–20. .Acupuncture—from empiricism to science: functional background to acupuncture effects in pain and disease.Med Hypotheses1995; 45:271–81. .Functional changes in back muscle activity correlate with pain intensity and prediction of low back pain during pregnancy.Arch Phys Med Rehabil1998; 79:1210–12. .The acupuncture treatment of low back pain: a randomized controlled study.Am J Chin Med1980; 8:181–9. .Acupuncture for chronic low back pain: a randomized placebo-controlled study with long-term follow-up.Clin J Pain2001; 17:296–305.